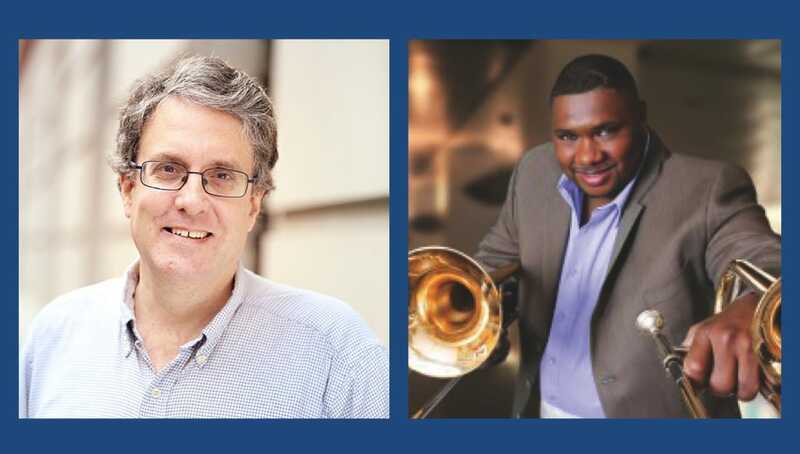 The Family Weekend President’s Concert, presented by Performance Music at The University of Scranton on Saturday, Sept. 22, at 7:30 p.m. in Houlihan-McLean Center, will feature an original composition by Joshua Rosenblum (left) and a performance by acclaimed trombonist Wycliffe Gordon. The concert is presented free of charge and is open to the public. Performance Music at The University of Scranton will present the Rev. Scott R. Pilarz, S.J., with a special gift to mark his return to the campus community. On Friday, Sept. 21, The University’s Concert Band and Concert Choir will perform the world premiere of composer/conductor Joshua Rosenblum’s “Don’t Waste Love” at Father Pilarz’s Inauguration as the University’s 27th president. The piece was specially commissioned for the event. Then, on Saturday, Sept. 22, the band and choir will perform the piece again with Rosenblum and internationally acclaimed trombonist and composer Dr. Wycliffe A. Gordon at the Family Weekend President’s Concert. The concert begins at 7:30 p.m. at the Houlihan-McLean Center, Mulberry Street and Jefferson Avenue. Admission is free, with seating on a first-come, first-seated basis. Performance Music Conductor and Director Cheryl Y. Boga said concertgoers can also expect a few surprise guests at the concert, which should take on a special resonance, given the occasion. “Our sense of community here on the University campus is one of the things that I think really makes us unique,” Boga said during a recent interview with the Scranton Times-Tribune. This isn’t the first time Rosenblum has worked on behalf of the University. In 1998, he composed “The Just Man” for the Inauguration of the Rev. Joseph M. McShane, S.J. Boga came up with the text for the Father Pilarz piece. “I took some phrases from some of Father Pilarz’s more inspirational speeches from the first time he was president, and then I combined them with some quotes from other Jesuit writings and poems,” Boga said. Father Pilarz’s phrases proved a great source of inspiration to Rosenblum as he composed the music. In particular, the phrase “Don’t waste love” provided the melodic framework for the piece, he told the Times-Tribune. “He’s a big deal,” Boga said. Meanwhile, Gordon, considered one of the greatest jazz trombonists of all time, will perform a community-focused call-and-response piece with the student musicians. A longtime friend of Performance Music, Gordon has performed and taught extensively at the University, which awarded him with an honorary doctorate in 2006. The 70-plus-member Concert Band and 60-plus-member Concert Choir consist mostly of students, with some faculty and staff members. Because there is no music major at the University, all members have been brought together by their mutual love of making music. For further information on the concert, call 570-941-7624, email music@scranton.edu or visit scranton.edu/music. For more on Gordon, visit wycliffegordon.com. For more on Rosenblum, visit rosenblummusic.com.